Catting Around | The Kids Beat | Kids VT - small people, big ideas! Books: "Homer: The Library Cat"
In a new book by Vermont author Reeve Lindbergh, a quiet-loving cat escapes from his home and works his way across town to find his owner at the library, a purr-fect spot for Homer, the Library Cat. Lindbergh, who is the daughter of Charles Lindbergh and Anne Morrow Lindbergh, lives in the Northeast Kingdom. She got the idea for the book when a librarian's tabby escaped from the St. Johnsbury Athenaeum. "The trials of Homer and his adventures across town were a topic for daily discussion as we continued to look for him," says Lindbergh. Homer's tour takes him down busy sidewalks, to the fire station and through the rail yard until he ends up at the library, where he shares his stories with the children there. Only a few lines of Reeve's rhyming text grace each watercolor-illustrated page, which makes the book appealing for young readers who enjoy seeing and hearing a story develop. 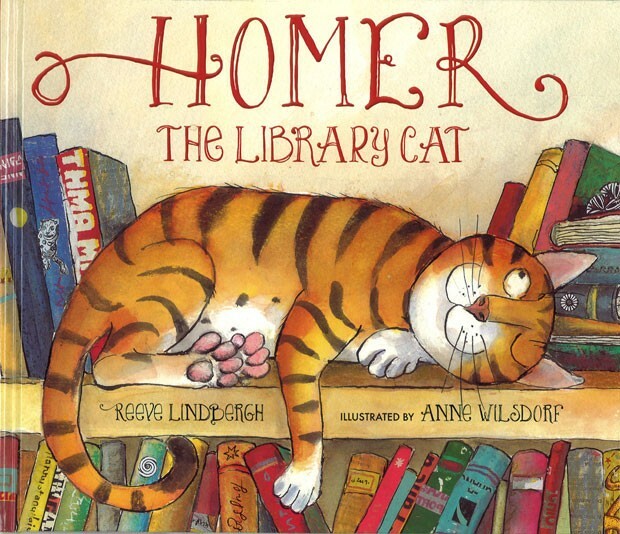 "Homer, The Library Cat:" By Reeve Lindbergh, illustrations by Anne Wilsdorf, Candlewick Press, 32 pages, $15.99.